Aeisha @ Tamaki Primary School: Aeisha - volleyball. 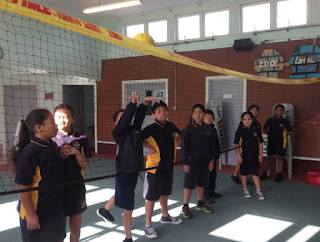 Last week Monday, room 8 went to volleyball on the top courts. It was an exhausting session. All Room 8 loved it with our new coach Eleanor, she was so nice she taught us how to shift,get in position, also how to serve carefully. We had the best first volleyball session with coach Eleanor, we all played some games.